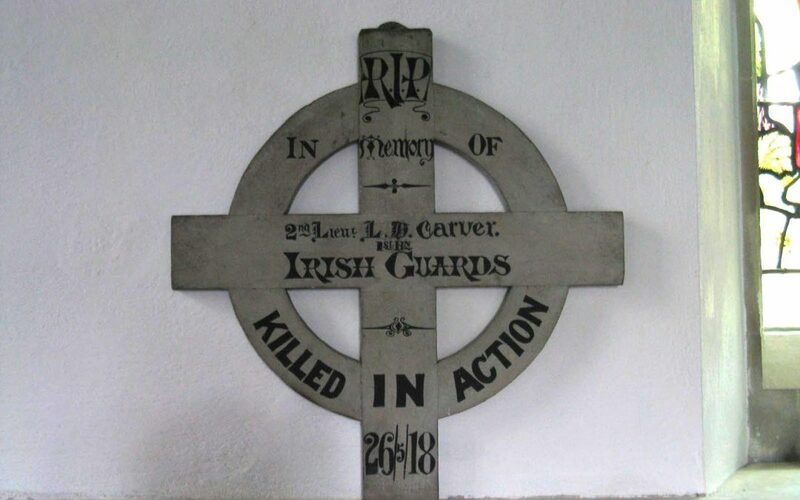 Battlefield cross for 2nd Lieutenant L. H. Carver, 1st Bn., Irish Guards, died 26 May 1918. In common with a number of guards crosses this has a Celtic style wheel. 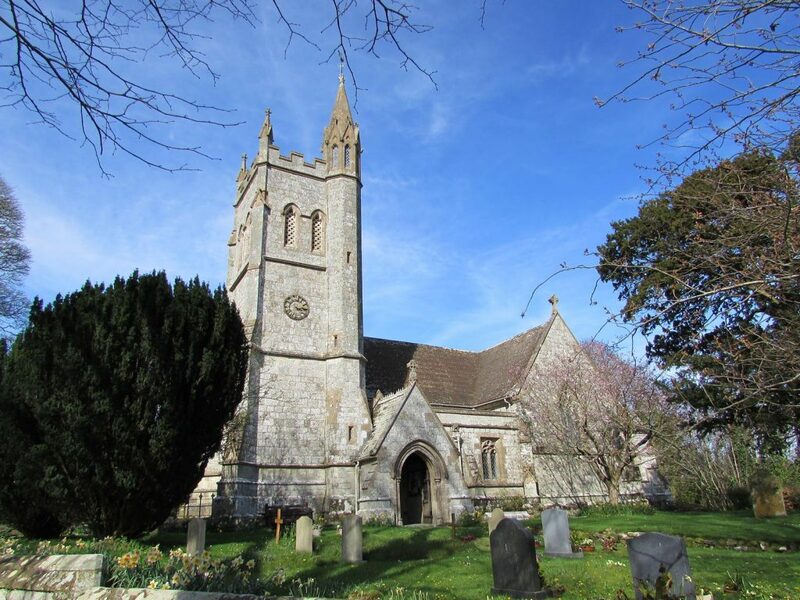 Lionel Carver was the eldest son of the Rector of Melbury Abbas, the Rev. Henry Jonathan Carver (1847-1915) and Blanche Emma Carver, née Liptrap. 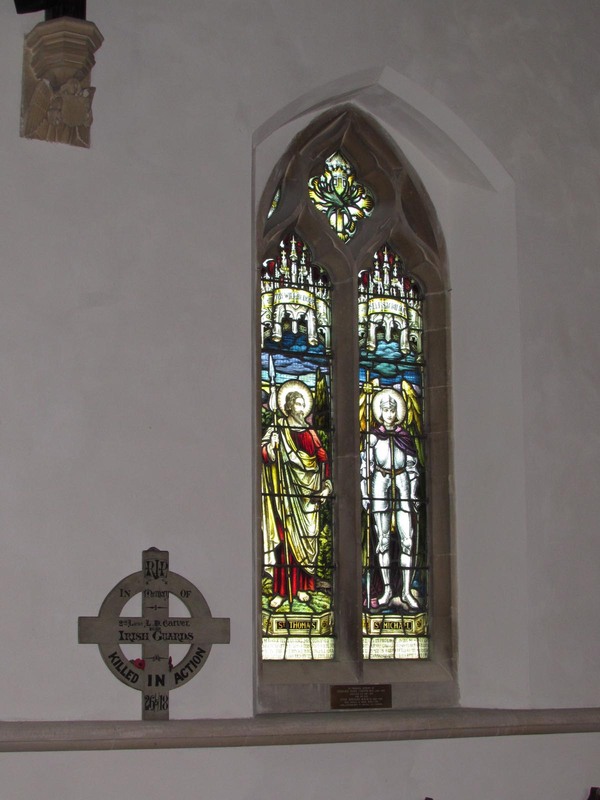 His sister, A. Mildred Carver, published a short account of living at the Rectory at Melbury Abbas in the Dorset Year Book for 1975-76, but only mentioned Lionel in that with regard to the window erected to his memory inside the church. Carver is, however, mentioned in Rudyard Kipling’s The Irish Guards in the Great War: the First Battalion (Stroud: Spellmount, 2007). The dates don”t quite match, but Kipling includes an account of a successful night-time raid near Ayette in May 1918, following which a single shell came over at “stand-to” the morning after and killed 2nd Lieut Carver in a front line trench (p. 230). 2ND LIEUTENANT LIONEL HENRY LIPTRAP CARVER, Irish Guards, whose death is announced, was the elder son of the late Rev. H. J. Carver, rector of Melbury Abbas, Dorset. He was educated at St. John’s School, Leatherhead, and gained a scholarship at Jesus College, Cambridge, where he took Classical Honours. From there he entered the firm of the Bombay, Burmah Trading Corporation, spending 10 years in the East. At the outbreak of war he joined the Rangoon and Moulmein Volunteers. He returned home in March 1917, for military training, and joined the Irish Guards, going out to the front with his Battalion last December. CARVER, LIONEL HENRY LIPTRAP, 2nd Lieut., 1st Battn. The Irish Guards, elder s. of the late Rev. Henry Jonathan Carver, M.A., Rector of Melbury Abbas, by his wife, Blanche (Hatchlea, Ockley, co. Surrey), dau. of the late Lieut.-General John Liptrap, of His Majesty’s Bengal Army; b. Melbury Abbas, co. Dorset, 16 Oct. 1883; educ. St. John’s School, Leatherhead, and Jesus College, Cambridge (Classical Honours); entered the service of the Bombay Burmah Trading Corporation, Ltd., in Sept., 1906, and went to the East the following year; joined the Moulmein Volunteer Rifles 19 July, 1915; returned to England in March, 1917, and was gazetted 2nd Lieut. the Irish Guards the following Oct; served with the Expeditionary Force in France and Flanders from 17 Dec., and was killed in action at Arras 26 May 1918. Buried in Ayette British Cemetery. His Commanding Officer wrote: “I can’t tell you what a loss your son is to the battalion. He was quite my best junior officer — he never failed me in anything I asked him to do. He was keen, thorough and energetic in all his work, and he was rapidly acquiring the knowledge that would have made him a first-class leader.” The Bombay Burmah Trading Corporation also wrote: “It is a very difficult matter to express in any way adequately the loss that the Corporation has sustained by his death, as his natural ability and unlimited capacity for work had so long ago made it a certainty that he would eventually fill the highest position that the Corporation could offer him with the greatest distinction and credit.” While at Moulmein, Mr. Carver was the first organizer and secretary of the local branch of the St. John’s Ambulance Association; unm. 2nd Lieut Carver’s name also appears on the war memorials at Jesus College, Cambridge, and the Church of St Margaret, Ockley, Surrey. Special thanjks to Michael Day for the photographs and research. His original post is here. Lionel Carver is my great uncle. He is remembered on the memorial to fallen members of the Bombay Burmah Trading Corporation in the Anglican Cathedral in Rangoon, Burma (now Yangon). If anyone has a photo of the memorial I would be pleased to have a copy. I am sorry that I do not have the photo you are looking for but am writing you as Lionel was also my great uncle. My grandmother was Blanche Emmeline Carver. I think that you are Bernard’s grandson. I am looking up information about Lionel today as it is Rememberance day and especially since it is 100 years since the end of the war and his death. Sad that he had so much to live for but voluntarily gave his life. If you are interested in corresponding about the family, I would be happy to share. I am in touch with many family members here as well as Anthea Barker whom I learned of a few years ago.